Ya’ll may have given up on me posting tonight.. I mean it’s almost 9 pm .. where the heck has she been? 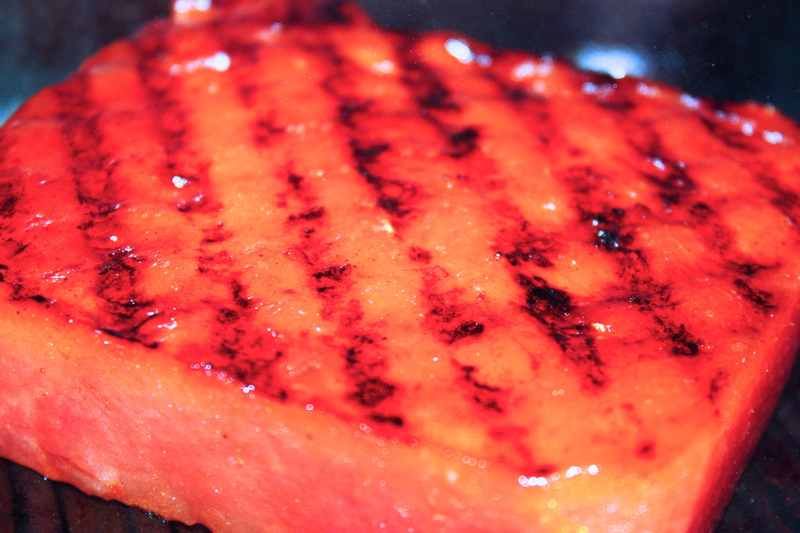 So let’s talk watermelon. It’s a melon. It’s made of water. Lots and lots of water. I have always loved watermelon. As an adult I started to appreciate it back in the early 90s when I read the book Fit for Life . Anyhoooo… The preface is that your body is made of mostly water so you should eat mostly food made of water. Also, you should never eat a protein and a carb together, never eat fruit with anything other than fruit.. that you get out int the sun and soak up the free vitamin D.. and most importantly, only eat fruit until noon. And the fruit should have high water content. Like watermelon. Because it’s made of water. Are you gettin’ where I’m going here? Are you smelling what I’m cooking? 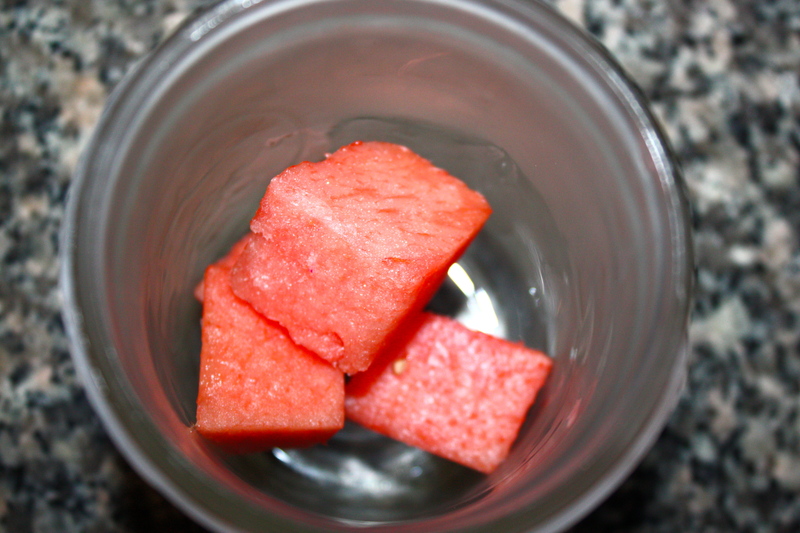 watermelon is chock full of water. *ducks* ok. ok. I get it… you know what I am trying to say.. So Rach (I can call her, that, we’re buds)was talking about how watermelon was made of….ok.. you get it, I know, I know!!! Let’s play a game. Let’s look at some pictures. 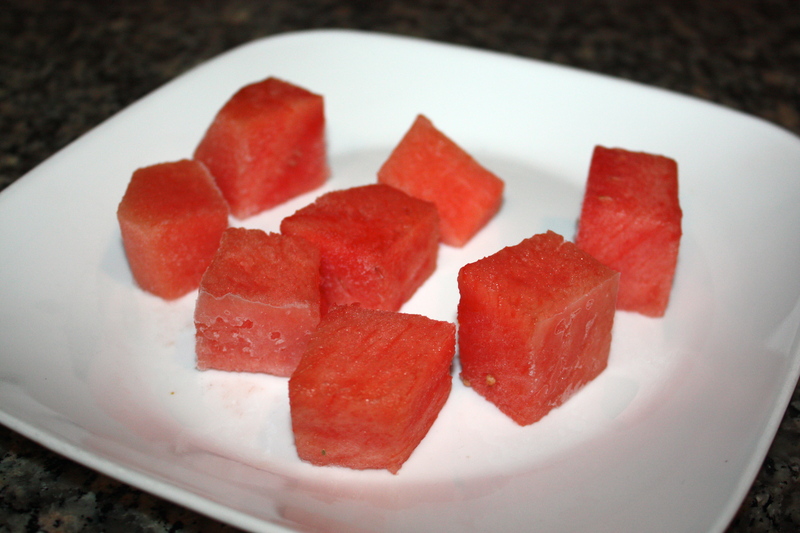 look liked plain old cubed watermelon, right? SHUT THE FRONT DOOR! you have figured it out, haven’t you… you are a genius.. you are… YOU ARE!! 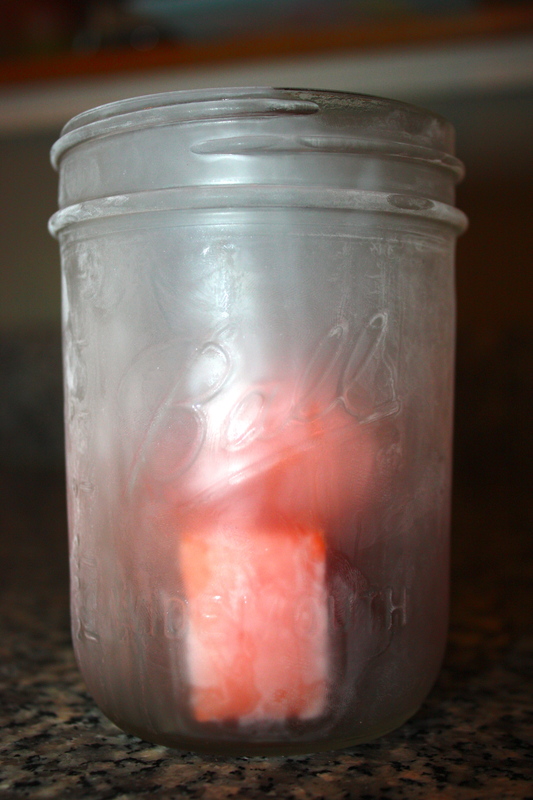 She made watermelon ice cubes!!!! because #$%^& melon is made of #%$%^ which freezes! GENUIS! 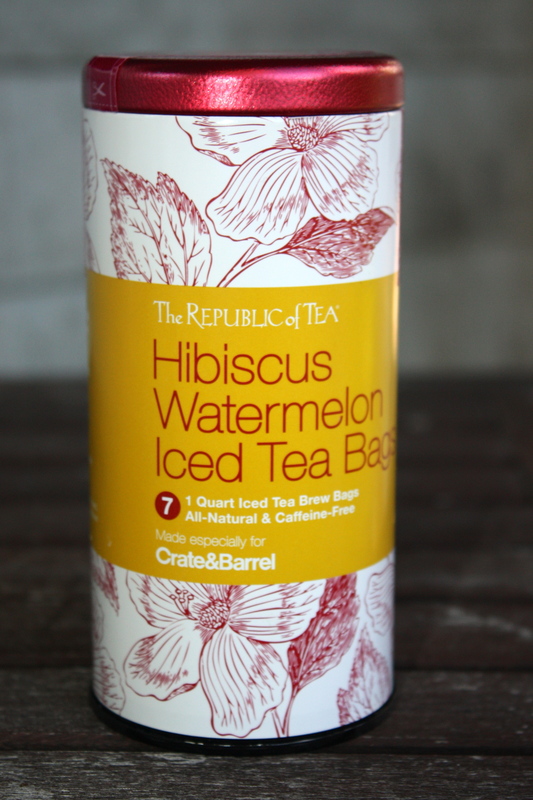 tea that Amanda and I found while she was here..( on clearance!).. 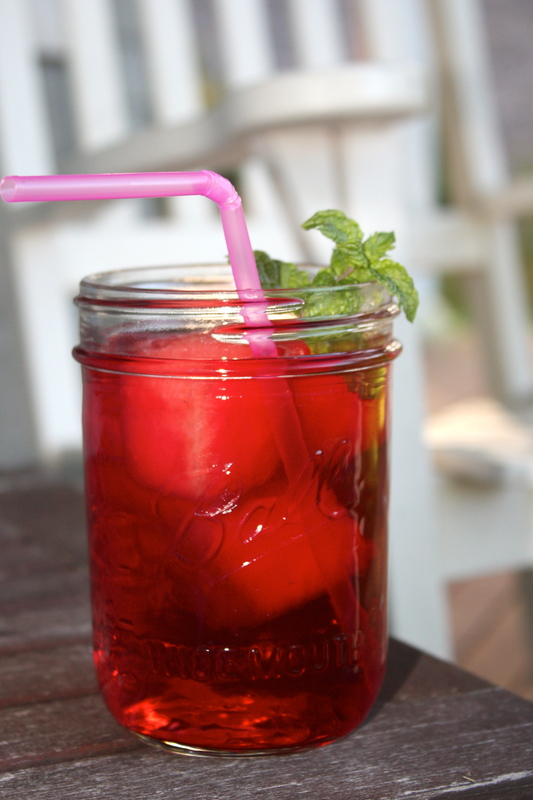 although I think that you could use any fruit tea.. truth be told, it was her idea to use this tea with the cubes… she also comes from great jeans genes. So the next recipe…. 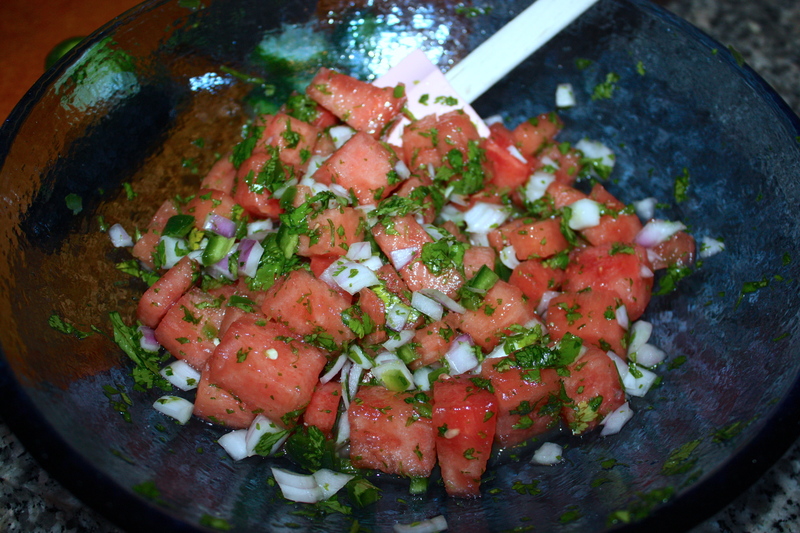 Years ago I came up with a brilliant idea to make a watermelon salsa. I was SOO proud of myself and promptly made some for my mom proclaiming my obvious talent. and mix :).. seriously… you CAN do this! 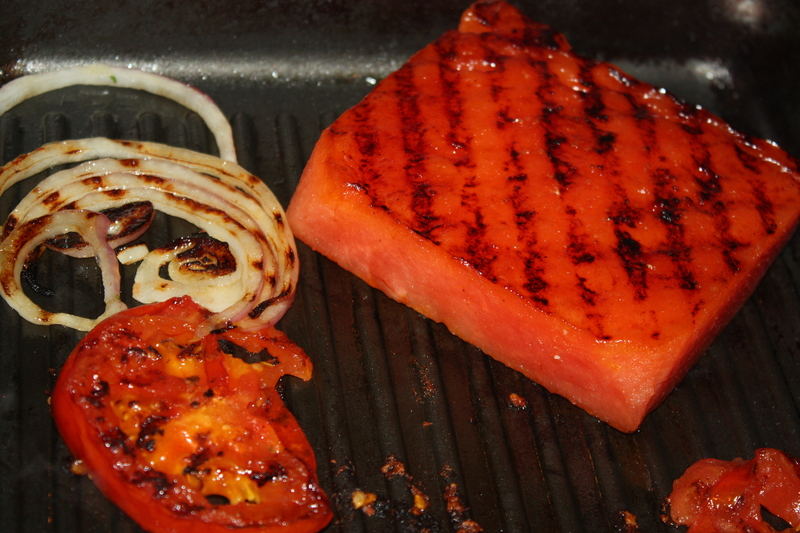 You can top grilled chicken with this, tofu. Top a salad… or eat it alone. 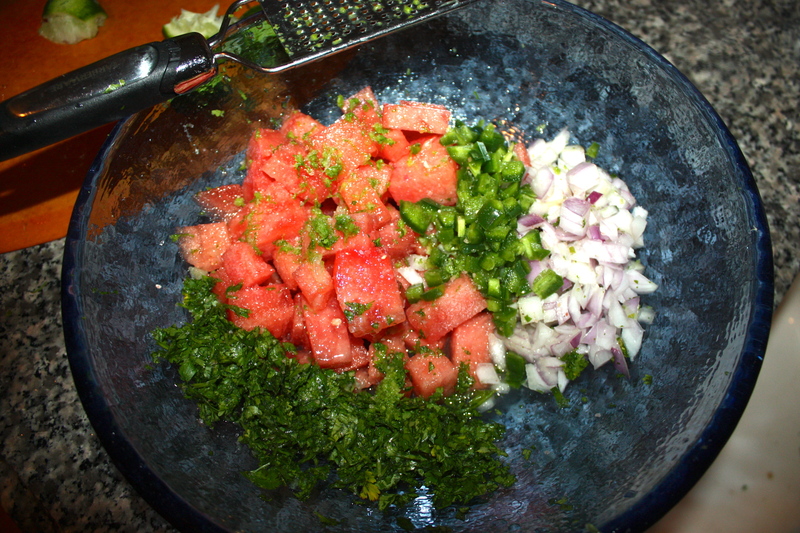 Place the watermelon on a plate, pretty side up, then arrange remaining ingredients ( except lime) on the plate.. 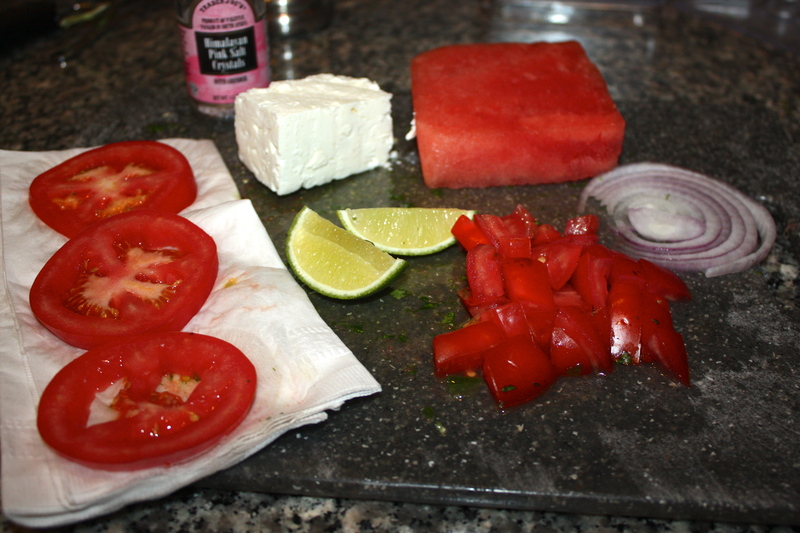 Squeeze on wedge of lime over the salad and garnish with another. this recipe is sensory overload. 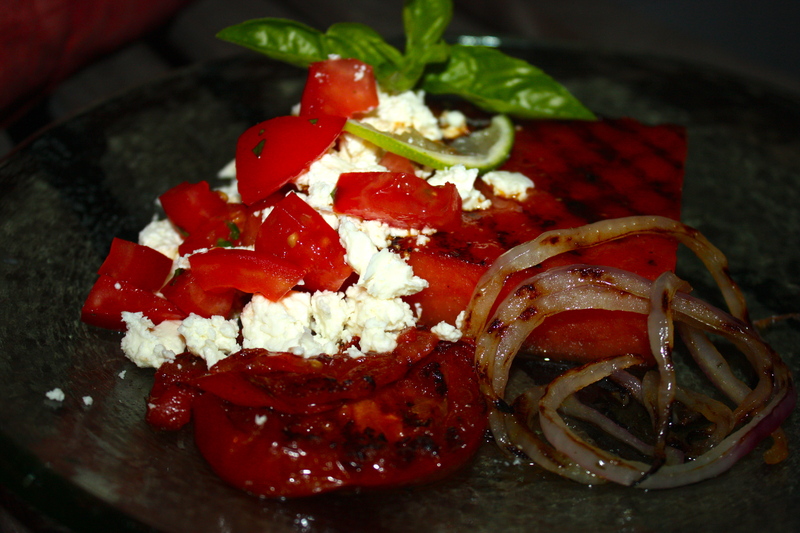 The smokiness from the watermelon with the sweetness of the onions, the depth from the tomatoes and the zing from the lime juice & saltiness of the feta….. I loved this! I saw a similar combo on the show and have obsessed over it since then. ’cause sometimes I do that.. I have a kitchen to clean! 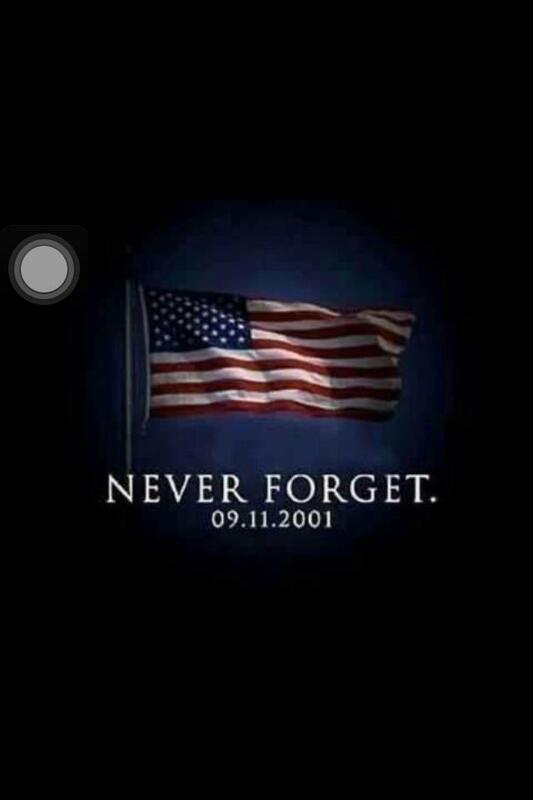 A day that will we will never forget. It was a day that we held the ones around us just a little bit tighter.. because we could. this was a day that everyone remembers where they were.. what they were doing and who they were with. It was a beautiful Monday morning. The kids had recently gone back to school. 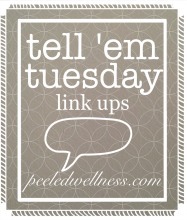 I was a cosmetologist with some wonderful clients and I would often go out of my way to accomodate their schedules. Back in the the the Beauty industry really didn’t work on Monday. They just didn’t. One of my favorite clients ( they all were, really ) was Mrs. M. That’s what everyone called her.. never by her last name. She was from new Jersey and had a summer home in Chatham, on cape cod. She was a fabulous cook and we got along perfectly despite that fact that she could have been my grandmother. So I had met her at the salon for a 9 am appt. It was just the two of us. I didn’t bother to turn on the radio because she didn’t like music… and we would be doing what we always do.. I would be doing her nails & we would be talking food. Which we did. For over an hour. We left the salon together around 10:20 am. I went to the grocery store, and remember thinking how happy I was.. It was fall, my favorite time of year, I had a great job, happy kids who were busy in a cute school house being educated and I had a beautiful kitchen to cook in and the afternoon to do just that. I left the salon and went to the grocery store. And stood at the deli and ordered turkey breast. Now I was really confused because I still had not known. The blood went from my face and I left the store, leaving my cart behind. You see, Scott worked in Boston. a few blocks from the world Trade Center and his company actually had meetings there often. I quickly drove home ( I lived close) and saw the answering machine blinking. I tired calling Scott’s office and did not get an answer. This was before cell phones so I only had the one number. Sick to my stomach and worried how I was going to raise my kids on my own I sat on the couch and finally turned on the Tv. It was only then that I realized that it was the World Trade Center in NYC, not in Boston. I felt relief, then sadness.. I could not believe what I was seeing. All of those people, all of those families.. I never did hear from Scott. And I kept worrying about that because at that point, America didn’t know what was next .. it was surreal. He arrived home almost 3 hours later. HIs company sent everyone home as a safety precaution.. and he never thought to call me to let me know. he was home safe, but I still kept thinking about all of those people who weren’t so lucky… all of those familes.. lives changed in an instant. I hugged my kids so tight that day. A new new generation of Military was born that day… Kids in middle school who quickly learned that they loved their country and that they would fight to defend it… Years later, I’m proud to say that both my son & nephew were two of those kids. We all know that sadness and empathy that came in the days to come. I know this anniversary affects some more than others, so if my thoughts and prayers go out to you if you or your family were directly involved. 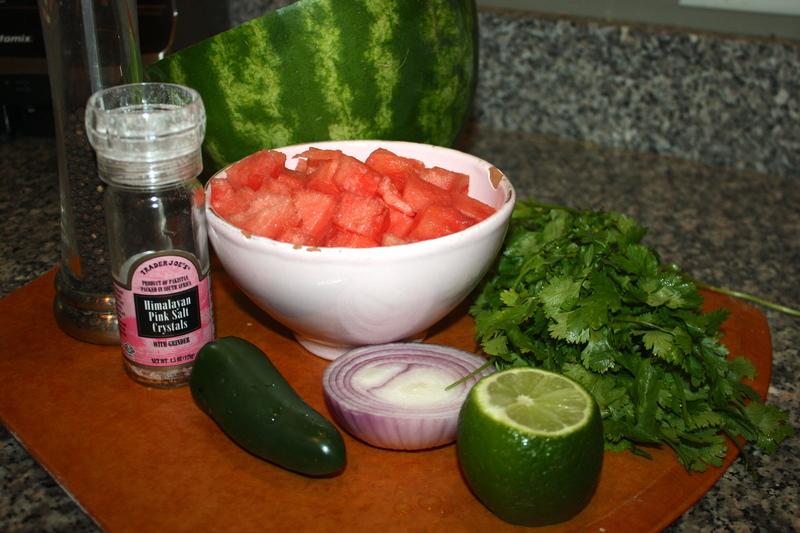 I’m off to play with some watermelon, but I felt like I needed to acknowledge this day and share my story….. 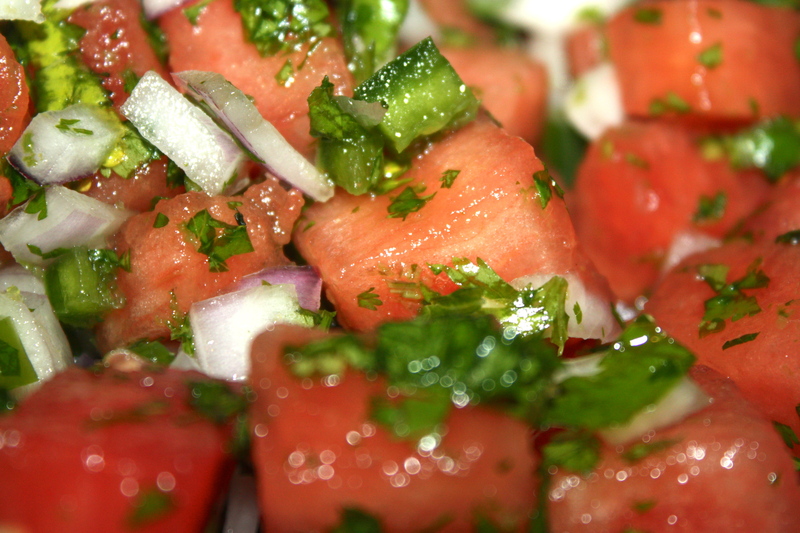 I woke with every intention of sharing 3 watermelon recipes with y’all…… oops..
and truthfully, I feel possibly even further behind then when I woke. There are many things that I like about my blog, but there are also things that I cannot do here and really want to be able to. I plan on being very dedicated to this and if I can’t do everything that i envisioned here, then I need to find somewhere else. This is where I am lost.. I did purchase my own domaine ( Greek to you.. I know TRUST me me too 😦 ) .. but there is soo much more to know. where is my magic blog fairy to come set this all up for me so that I can cook and quilt and sew and share…..
I’m not giving up.. I”m just a tad fried right now. Brushing my teeth today would have been over-rated.. right? Right.